A few weeks ago of a Tuesday afternoon, Colleen Plank showed me some woven samples, weaving records, and one or two students' scrapbooks from their days of the weaving school. Nelson Polytechnic's weaving school was apparently famous throughout New Zealand in the 80's but by the time I arrived it'd been long closed. I don't even know its official name, but it is referred to as The Weaving School. I've never been able to find out much about it on the Internet, but since I know quite a few alumni and/or ex-tutors, I may need to write down some of what they tell me, since nobody seems to have done it yet. The only thing I know is a German weaver named Anna Correa-Hunt headed it. Her warping mill and everything left at the Polytech, (NMIT, Nelson Marlborough Institute of Technology since 2000,) have now been donated to the Nelson Provincial Museum. And Colleen knows who owns Anna's loom which happily it's still in Nelson. For a long time I lamented the closure of the school because I though I would have loved to attend it. But looking at the samples students were required not only to weave but to file properly, I can guess at the rigidity of the course and while it might have suited my thinking, I might have gotten very bored with weaving itself. And I would not have made the cut looking at the technical exactitude required to pass. 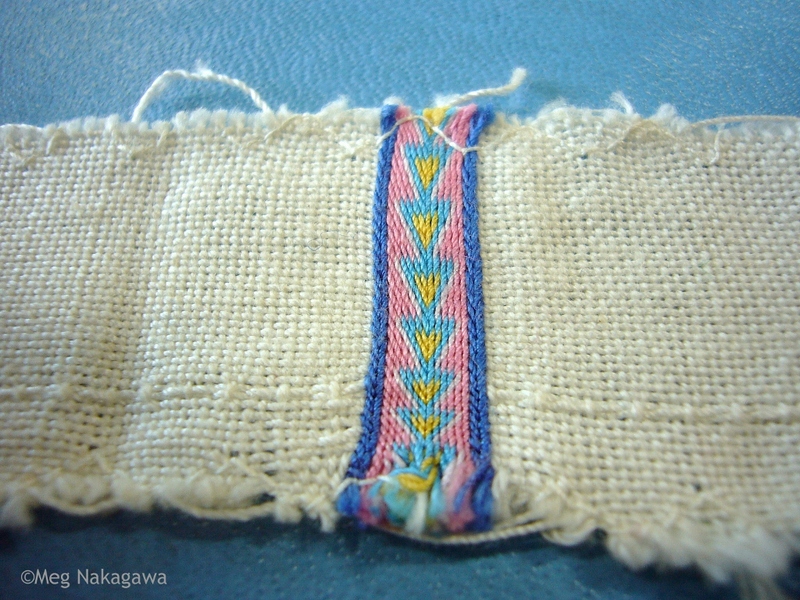 Colleen, an alumnus herself, said her classmates who attempted art/conceptual expression using weaving as a technique, (and there were a few vanguards even back then,) and she recalled some of the best "artists" in her year could not graduate. 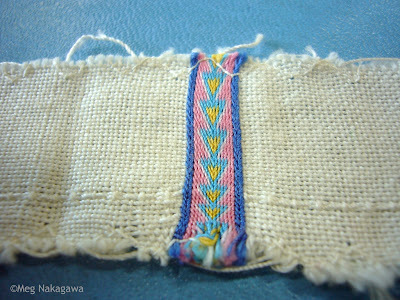 Most samples, (and there were many, many twills,) were woven in wool or cotton. Some wool yarns were amazingly skinny singles, the kind I have not seen sold since I started weaving in 1995. There were also skinny hand-spun wool yarns. In general, they were coarse, and today may suit overcoats or picnic blankets, possibly upholstery and curtains, but not scarves or shawls. There were far more colors than I had imagined, as I imagined only natural sheep. There was a huge dye component in the curriculum. 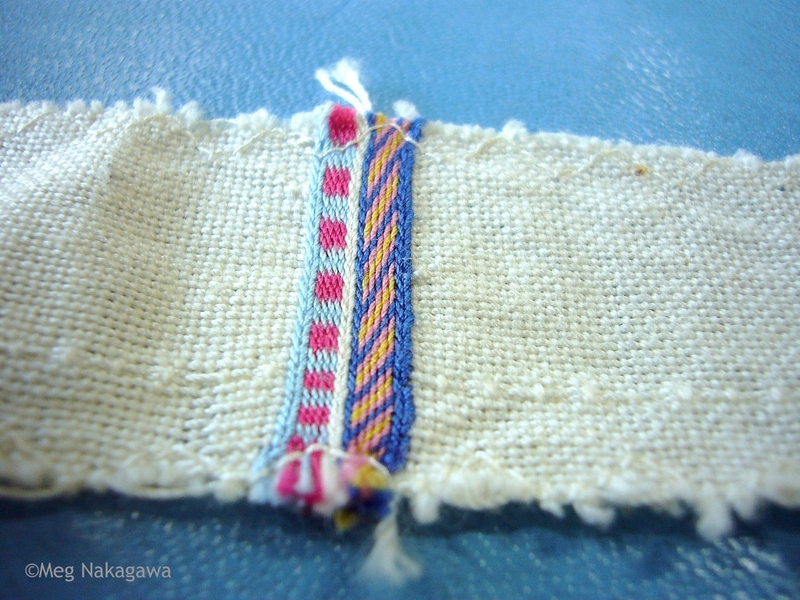 I found two tiny swatches of loom-woven, extremely-fine cotton cloth which incorporated card weaving. Colleen tried to explain how it was done but I couldn't even begin to see the picture, and our own Rose Pelvin, who knows everything, declined to demonstrate it for me! Anyway, have a look! I almost asked if I could keep them! Above is my favorite because it has design interest in the "background" cloth as well. 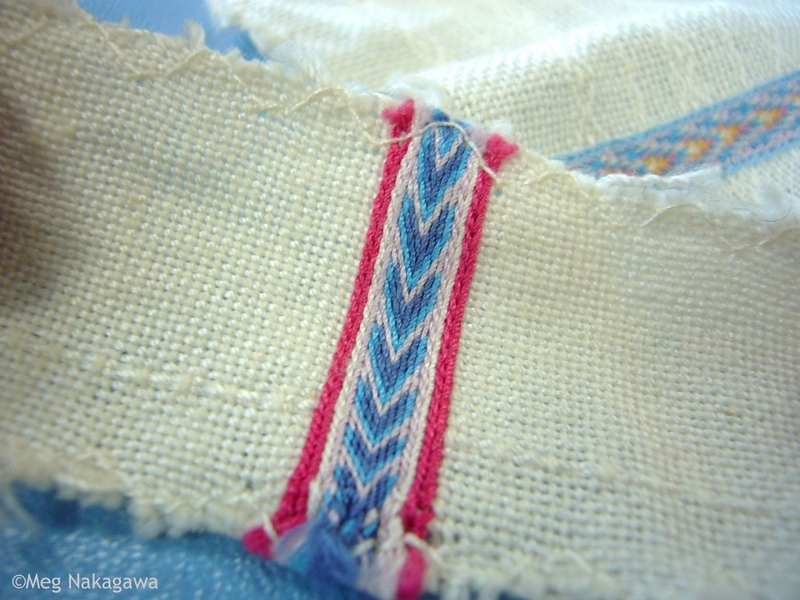 But the next three pictures were taken from one swatch; it had three warp-wise stripes using different card designs and colors, and as a weaver, I could not help myself exclaiming a few polite but exclamatory words. Tradition vs innovation has been on my mind. I don't spend much time with Marketing exercises these days, but I find they help when I want to place myself on my imaginary spectrum of art/craft weaving continuum, or take my perception of others' expectation to see "Japan" in my work in stride. Most of all, I am most pleased I was not taught in a traditional weaving environment; else I would have either lost interest in the pursuit of beauty/pretty, or failed technically. In the course of looking up the Weaving School, I found this link, "The Evolution of New Zealand Textile Artists - A Selective Annotated Bibliography of Resources". I've not looked at it yet in any depth, but to some it could be a stroll down memory lane. I'm with you; I couldn't have lasted the course, sample after sample. I'm too impatient. Recently bought a book on card weaving but haven't studied past the first few pages. I wanted this one book on card weaving for years and then Mom gave it to me and some cards some years ago. I like looking at the book, but I haven't tried it yet. I keep thinking it might be a good thing to take on a trip, but I guess I haven't traveled! 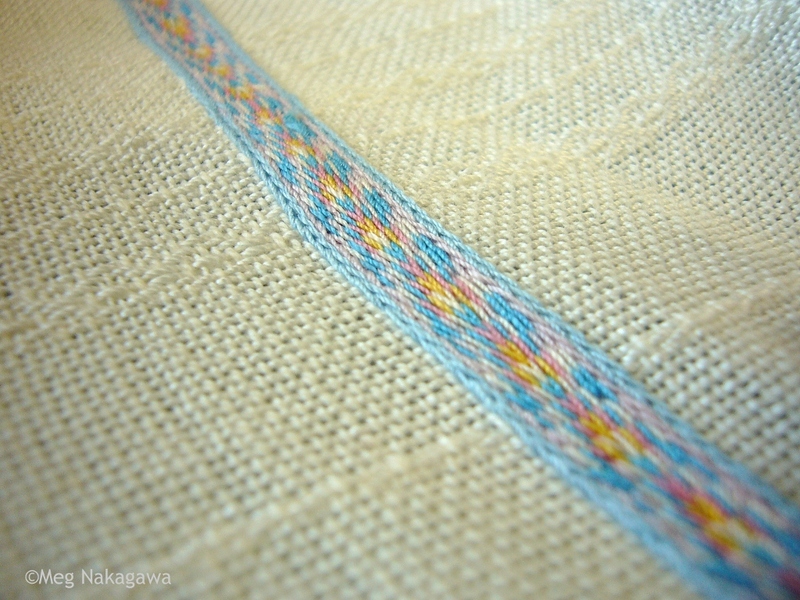 I do a lot of incorporating tablet weaving into fabric. I have developed a small Video about incorporating tubular selvages into fabric and have uploaded it to YouTube. It is at http://youtu.be/Kmecc5UV8n4 if you are interested. Inge, Inge, Inge!! That is fascinating. And I can see how I could do this in the middle of the sloth, too. 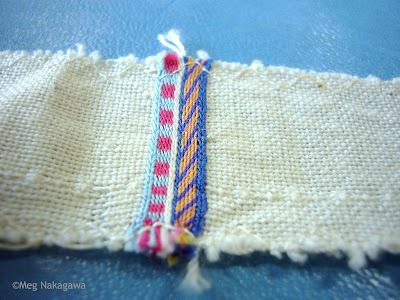 As well, I don't need gazillion shafts nor worry about pick up to incorporate those lovely "ribbons" in the selvedge! Thank you so much for this link.